David Letterman is retiring next month, so starting this week I am watching each of his shows all the way to the end. I will miss his irreverent and dry take on everything from phony movie stars and politicians to the self-deprecating shots that he always aims at himself. I’ll also miss his pranks with unwitting people out in public, and of course his nightly Top Ten. 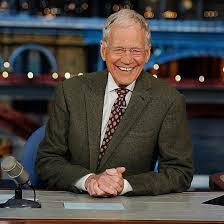 Dave has been a huge part of my TV viewing routine going back to his very early days at NBC in the 1980’s. For me anyway, his exit leaves a very large void in late night television. In recent years I haven’t watched him with much regularity. With other late night comedians being introduced, Dave’s act sometimes seemed a bit dated. There have been more than a few nights when I thought he and his writers hurriedly tossed the show together and got it out-of-the-way so that they could enjoy an upcoming weekend instead. But then there have been other moments when his creativity came zooming back. When Conan O’Brien was out-maneuvered from his job a few years ago, Dave was absolutely brilliant in his skewering of Jay Leno’s insistence that he was, again, not complicit in another talk show host’s demise. Likewise when Robin Williams passed away, Dave’s tribute to him was touching, sincere, and heartfelt. If Dave was totally on his game, there was nobody better. Of course, he was also able to make us cringe and be uncomfortable from the relative safety of our couches and easy chairs. In his early years, you never quite knew how he was going to treat some of his guests. He took acerbic to new levels in mocking and trashing the very guests who came on his show. For example, I always felt sorry for Richard Simmons, to whom I thought Dave was unnecessarily cruel. It took bad-asses like Cher and Charles Grodin to sometimes put him in his place. The Motion Picture Academy only had to learn once that Dave was not the best choice to host the Oscars — he was simply awful on his one and only turn. We also learned too much about an affair that he had with a young female staffer when a writer-producer for CBS News tried to blackmail him with a threat to expose the details of it in a “screenplay” that he was allegedly writing. Dave instead contacted the Manhattan district attorney’s office, who quickly followed up with a police sting operation that resulted in their arresting the man after they presented him with a phony check. As uncomfortable as it was watching Dave explain the sordid details of the whole episode afterwards, I remember laughing when he said that he thought of asking the police to use one of those huge Publisher’s Clearing House sweepstakes type-checks to give to the blackmailer during the sting. It is fairly well documented that Johnny Carson wanted Dave to ultimately get the Tonight Show after he retired. It is also apparent that Johnny continued to favor Dave in the years when he was largely out of sight. When Johnny died, Dave did an entire monologue of previous jokes that we only then-learned had been sent in from Johnny on a consistent basis for years. We had been occasionally laughing at Johnny’s jokes via Dave and never knew it. And, of course, Dave’s final tribute to Johnny was the most heartfelt among all the late-night comedians. Jay Leno simply never had the same relationship with Carson as Dave, and I remember Leno’s own tribute being rote, forced, and uncomfortable to watch. When it was over, to me he appeared relieved that he had dispensed with the obligation of having to honor Johnny. I was personally never a huge fan of Dave’s silly Stupid Pet Tricks, Will it Float?, Is This Anything?, or most of the audience-participation bits. He once said about them that he and his writers would pick an annoying gag, run it till everyone got really sick of watching, and then continue it for an additional two months for good measure. When I read that, I suddenly liked them for the first time because I felt “in” on the whole joke, as tiring as they ultimately became. Dave has always used irony so creatively. In fact because of his influence, I still sometimes say “nice to see you!” to people who I am not all that happy to see. It would appear that he’s not always been such a good role model for me. You can’t really say it much better than that. Starting in September Stephen Colbert will be the new host of the Late Show, and I will definitely be watching. Colbert is gifted and talented, and I have no doubt he will re-make late night television in a way that is unique and fresh. I also enjoy Conan O’Brien and try to at least catch one of his shows when possible. Ditto for the new guy at CBS, James Corden; from what I’ve seen he is refreshing and very genuine in his approach. Brace yourself in the coming weeks for those inevitable “end of an era” pieces that will be written about Dave leaving his show Indeed it is the end of an era. But I sense the last thing Dave would appreciate is mawkish sentiment about him or what his retirement means. Because I’m sure he reads my blog regularly, I won’t then embarrass him with any of my own. I will just say that I will miss him, and certainly my world was better with him being a part of it for an hour each evening. Thanks, Dave. Dave has been one of my favs too. Mostly I fall asleep when he’s on but he’s there in my bedroom with me. Great post. Dave certainly is a classic. A true Dave signature is his, in my opinion, overuse of the word ‘tremendous’. It seems to his favorite adjective! Haha, I think you need to do a whole new post on fantastic Dave-isms. Whether or not he genuinely thought they looked or smelled great we’ll never know, but he has certainly mastered the art of schmoozing. I’m quite sure he reads your blog. What else does he have to do? The end of an era! I thought it was a big mistake to deny him ‘The Tonight Show’ but he did very well regardless.